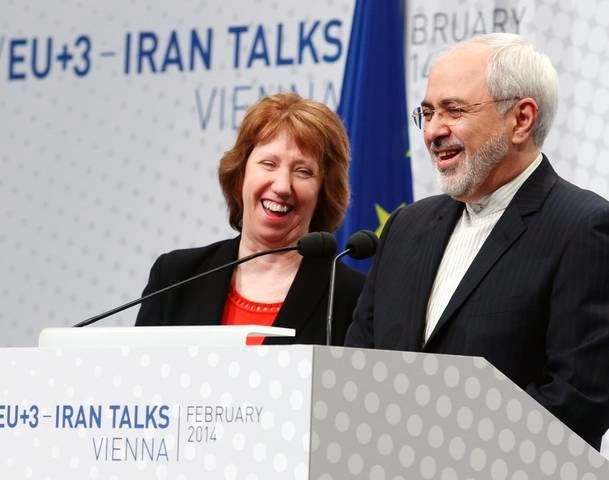 European Union foreign policy chief Catherine Ashton (L) and Iranian Foreign Minister Mohammad Javad Zarif share a laugh during a press statement after a conference in Vienna February 20, 2014. "We have had three very productive days during which we have identified all of the issues we need to address in reaching a comprehensive and final agreement," European Union foreign policy chief and lead negotiator Catherine Ashton announced at a brief joint press conference in Vienna on Thursday morning. Standing alongside Iranian foreign minister Mohammad Javad Zarif, she added, "There is a lot to do. It won’t be easy but we have gotten off to a good start." Following Ashton, Zarif repeated the statement in Persian. With an established framework for resolving outstanding issues and timetable of meetings over the next four months, Iran and the six world powers known as the P5+1 (or EU+3) - Britain, China, France, Russia, the United States and Germany - are continuing to defy expectations and rely on confident and optimistic diplomacy to reach a comprehensive accord over the Iranian nuclear program and the eventual lifting of international sanctions. Speaking on the condition of anonymity at a background briefing for journalists, a "senior administration official" (presumably Wendy Sherman) with the U.S. State Department was similarly positive. "I believe we have had constructive and useful discussions over the past few days, and we all do feel we have made some progress," she said. "Although we cannot predict everything ahead and we all know there will be many twists and turns, we do now have a path forward for how these negotiation will proceed." We had constructive conversations about all of the issues that will have to be addressed as part of the comprehensive agreement. Those discussions have created the framework and agenda for the negotiations going forward. We are trying to do this in as open and transparent a manner as possible, but for any negotiation to succeed it is critical to leave space for everyone’s points of view to be properly heard and taken into account. While the recent talks in Vienna did not produce a "formal, written-down framework or agenda, " she said, "we all know what it is and everything is referred to in some way in the Joint Plan of Action," referring to the interim deal signed by Iran and the P5+1 last November in Geneva. "We are at the beginning of a very difficult and complex process," the official noted. "It's going to be both a marathon and a sprint….We have a long distance to cover in a short period of time." Laura Rozen of Al Monitor, who was in Vienna reporting on the talks, wrote of some next steps. "Political directors from six world powers as well as Zarif and Ashton and their teams will reconvene for the next meeting in Vienna on March 17th," she explained. "That meeting will be preceded by technical experts consultations among the six powers and Iran, that seem like they will become almost ongoing throughout the next months as negotiators aim to advance a comprehensive accord."